military move goes as smoothly as possible. to be unpacked. This is a perfect opportunity to get rid of items that you no longer use regularly. of all of your belongings. boxes of paperwork when important documents are requested, everything is kept in the same place. to do is go the store for shampoo and toothpaste when you’re moving truck gets delayed. Take pictures. While your new place is completely empty, take pictures of all rooms and structures. when your next move arrives. 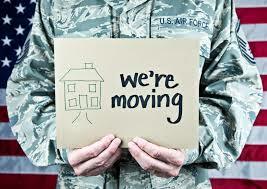 Military families move, on average, every 2-4 years. to move again, you won’t be blamed for the previous resident’s carelessness. in how smoothly the move will go.